Figure showing the conversion between incoherent and coherent electron correlations in the cuprates’ non-superconducting and superconducting states, respectively. Credit: Li et al. Published in Nature Communications. Ever since cuprate (copper-containing) superconductors were first discovered in 1986, they have greatly puzzled researchers. Cuprate superconductors have critical superconducting temperatures—the point at which their electrical resistance drops to zero—of up to 138 K at ambient pressure, which far exceeds the critical temperatures of other superconductors and is even higher than what is thought possible based on theory. Now in a new study, researchers have discovered the existence of a positive feedback loop that gratly enhances the superconductivity of cuprates and may shed light on the origins of high-temperature cuprate superconductivity—considered one of the most important open questions in physics. The researchers, Haoxiang Li et al., at the University of Colorado at Boulder and the École Polytechnique Fédérale de Lausanne, have published a paper on their experimental ARPES (Angle Resolved Photoemission Spectroscopy) results on high-temperature cuprate superconductors in a recent issue of Nature Communications. As the researchers explain, the positive feedback mechanism arises from the fact that the electrons in the non-superconducting cuprate state are correlated differently than in most other systems, including in conventional superconductors, which have strongly coherent electron correlations. In contrast, cuprates in their non-superconducting state have strongly incoherent "strange-metal" correlations, which are at least partly removed or weakened when the cuprates become superconducting. Due to these incoherent electron correlations, it has been widely believed that the framework that describes conventional superconductivity—which is based on the notion of quasiparticles—cannot accurately describe cuprate superconductivity. In fact, some research has suggested that cuprate superconductors have such unusual electronic properties that even attempting to describe them with the notion of particles of any kind becomes useless. This leads to the question of, what role, if any, do the strange-metal correlations play in high-temperature cuprate superconductivity? The main result of the new paper is that these correlations don't simply disappear in the cuprate superconducting state, but instead get converted into coherent correlations that lead to an enhancement of the superconductive electron pairing. This process results in a positive feedback loop, in which the conversion of the incoherent strange-metal correlations into a coherent state increases the number of superconductive electron pairs, which in turn leads to more conversion, and so on. 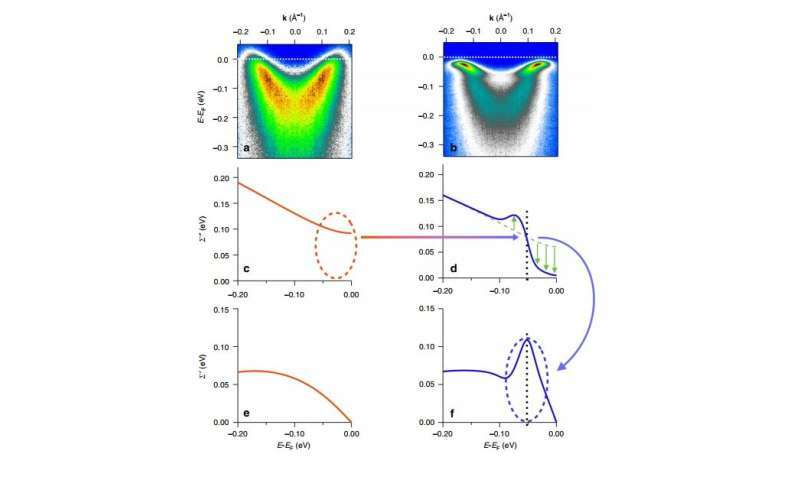 The researchers found that, due to this positive feedback mechanism, the strength of the coherent electron correlations in the superconducting state is unprecedented, greatly exceeding what is possible for conventional superconductors. Such a strong electron interaction also opens up the possibility that cuprate superconductivity might occur due to a completely unconventional pairing mechanism—a purely electronic pairing mechanism that could arise solely due to quantum fluctuations. "We experimentally discover that the incoherent electron correlations in the strange metal 'normal state' are converted to coherent correlations in the superconducting state that help strengthen the superconductivity, with an ensuing positive feedback loop," coauthor Dan Dessau at the University of Colorado at Boulder told Phys.org. "Such a strong positive feedback loop should strengthen most conventional pairing mechanisms but could also allow for a truly unconventional (purely electronic) pairing mechanism." Surprisingly, the researchers also found that they could describe their experimental results using a semi-conventional quasiparticle-like approach, despite the fact that cuprate superconductors behave so differently than other materials. In the future, the researchers plan to investigate whether this positive feedback mechanism can be integrated into other materials, perhaps leading to new kinds of high-temperature superconductors. "We can look for similar positive feedback loops in related materials, and can also use the newly developed ARPES-based techniques to probe the details of the electronic correlations in even greater detail," Li said. A bit of 'fine tuning' may yield room temp and above 'superconductors'. Possibly other discoveries and 'new physics' await along this line. This article is fascinating. This is the first thing I have seen that could actually allow not only the discovery of entirely new superconductor families but eventual development of much better superconductors. It is important to notice that improving current superconductors is not just about raising their critical point. It's also about reducing their susceptibility to magnetic flux, and making them more structurally robust, so they don't break when made into wires or magnets. Puzzling, how can one figure this in terms of causality without a very close model; or more specifically, in order to enumerate close, model the flow desired and locate the atomic structure and state, or something very close. Sounds pretty simple, why not define a crystal, a metal, or molecule, such that one electron per atom or molecule or interface doesn't care where it is, i.e. very little potential required to move it in any direction throughout the solid. Are liquids on the table, how about gas, gas and metal, or gas, metal, and liquid? If we don't know what we are doing; then, what are you doing? Easter Egging it? Hot and cold, specific potential? ... In other words, this would be a state of specific matter, like Transparency, it's the same thing, but only the field centers, so .. where are the centers? v We can make anything transparent, it just depends on 1 plane, i.e. minimal. Typically, rise in temperature is a rise in vibratory moments of the nucleus. I would not suspect electronic action until much "later", that would be shared ionization and di-ionization in an ordered manner throughout the matter. Can the nucleus be polarized, held to any plane, ... juz say'n. Johann F. Prins has realized this model when he observed diamond samples, which were subject of doping by oxygen ion implantation (for getting low temperature discharge cathodes for LED displays). Some electrons were attracted to surface of diamond by oxygen holes beneath it and they formed a superconductive phase there - at free air and at room temperature. But he wasn't aware, that similar mechanism http://www.superc...ltra.htm there. Are you trying to define the degrees of freedom? Think, when your feet in shoes and socks rub against the carpet and you touch an un-grounded metal doorknob; how do you draw and arc, i.e. 3 x 10^6 V/m * 1*10^-3 M, to enable a 1 milli-meter arc, or more. So why do you say there is no perpendicular motion? What if you only need the field? Then field and source. We already know this. V = IR; note: R may be a function of i or v or both. So isn't that what we are trying to do, create a n R = 0?